Edo State Governor, Mr. Godwin Obaseki has disclosed that part of his administration’s strategic plan was to ensure that Edo State becomes an economic hub through agricultural and industrial activities. This was as he received the American Ambassador to Nigeria, Stuart Symington and his team in Government House on Monday during a working visit. Governor Obaseki, who expressed happiness on the visit, said his government’s plan for development was to build on the foundation laid by his predecessor, Comrade Adams Oshiomhole. “I will consolidate on the work of my predecessor who has changed the fundamental landscape of the state. Coming in as an opposition, we worked hard, built trust, and helped to open economic space. The agenda is to consolidate on the work we started eight years ago”, he said. Meanwhile, the governor also expressed optimism that economic activities would thrive in the state because of its central location in terms of major infrastructure, gas and electricity. He said this administration, which promised to enhance the economic well-being of the people by creating 200,000 jobs, had charged the youths to avail themselves the opportunity to get employment through agricultural services. He revealed that his government would invest in capacity building so that the people could acquire requisite skills that would make them to be productive and self-reliant. “Our focus is to give the people the requisite skills. About 65% of our population is under the age of 30 years, so we need to empower them with the right knowledge so that they can be useful to themselves and the society”, he added. For his part, the Ambassador, Stuart Symington, who commended the governor for his good work, said the purpose of their visit was to ascertain how Nigerians are working together to solve the challenges of their country. 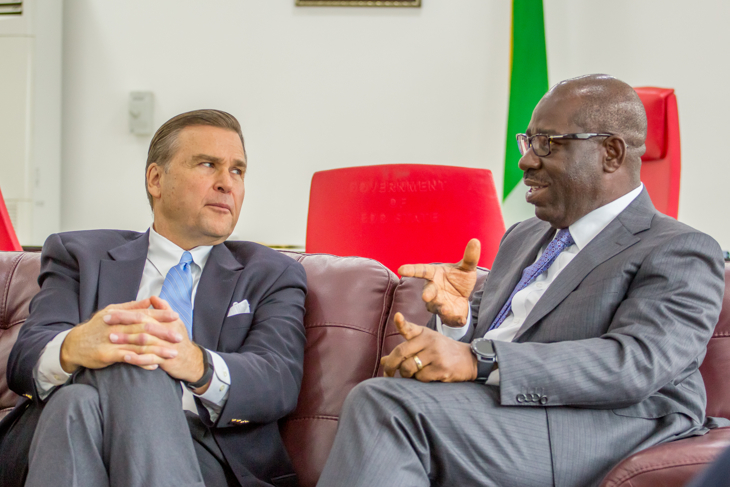 He added that America is determined to support Nigeria so that the development enjoyed in other parts of the world could be replicated in the country. The consul general and other embassy officials accompanied the ambassador during the visit.